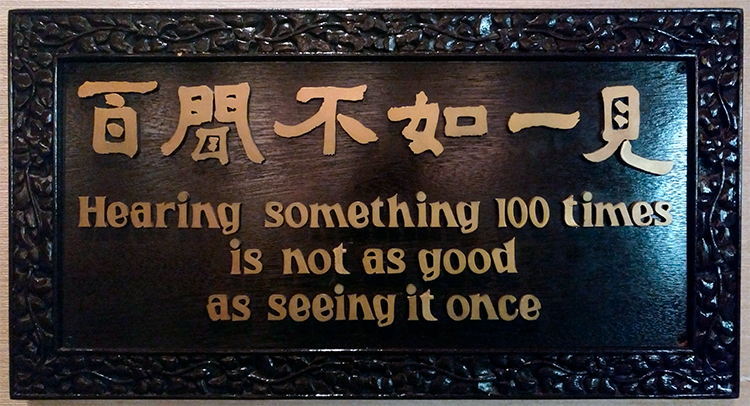 I recently stumbled across this sign at Disney’s EPCOT Center (China pavilion theater). Although it may have taken me out of theme park mode for a few moments, it makes an important point. When well-crafted slides and clear, concise data visualizations are used, the ideas and information necessary to getting things done in the world can be expressed more powerfully and have a better chance of making an impact. Do you have a favorite presentation-related aphorism? Please feel free to share it in the comments. Sally is also a very nice person but can cause many of the same sort of productivity problems as Vickie because, generous to a fault, she has yet to see a set of slides that shouldn’t be shared. Either she’s requesting comment/approval, asking for additional data, looking for help formatting, or even just “keeping everyone in the loop,” Sally emails presentation files hither and yon with joyful abandon and, sometimes, for no apparent reason at all. Emailing slide files for review, approval, production, or any other collaborative activity can be bad. Email is the sworn enemy of version control. It’s very easy to lose track of slides once released into the wild. You can never control how the file is going to be returned or when. You won’t know how many versions will need to be reconciled or which set of changes take precedence over the others. On top of all of the usual version control issues, Sally often overlooks the potential for serious security breaches that can occur because she is transmitting confidential or proprietary information via email. Sally and her co-workers could really benefit by moving all of their presentation files into SlideSource.com. Sally could rest easy knowing that everyone on her team will see her slides because they are available in a single, centralized location. Everyone else will rest much easier because that centralized location is highly secure and simple to use. Equally important, SlideSource.com has rigorous version control built in so no one will ever have to figure out where the most up-to-date slide is. It’s very possible you may be working with Sally Sharer right now. Or perhaps you recognize just a little bit of Sally in yourself. If that’s the case, please take a few minutes to visit SlideSource.com, sign up for a free, full-featured trial account. Once you’ve had a chance to see how it can make your slides both accessible and secure, you’ll want to invite the rest of the team to share in the fun. 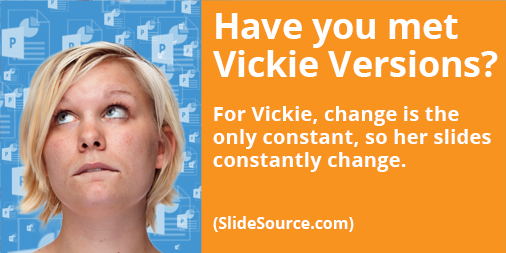 For Vickie, change is the only constant, so her slides constantly change. This drives her teammates a little crazy because she keeps her slides on her laptop and distributes them via email. With all these versions of her slide deck floating around, no one knows who has the current version. Even Vickie herself gets version vertigo on occasion. Even Vickie sometimes accidentally updates the wrong version of her slides and adds to the chaos. When different team members are all working on different versions of slides, it means someone is going to have to sort it all out…. and you can bet it probably won’t be Vickie. We think Vickie and her team would find SlideSource.com really helpful. All of Vickie’s slides would be maintained in a single, secure, centralized location. She can open any slide from within SlideSource.com and make changes to her heart’s content knowing that when she’s done there will be no confusion about who has the most up-to-date version or where it can be found. The team can rest easy knowing that SlideSource.com retains every version of every slide; keeping each one safe but behind the scenes so it’s out of the way but easy to get to. And every time Vickie updates a slide used in multiple presentations, they will all be updated automatically (if she wants them to be). It’s very possible that you find yourself working with a Vickie Versions right now. Or perhaps you even recognize just a little bit of Vickie in yourself. If that’s the case, please take a few minutes to visit SlideSource.com, sign up for a free, full-featured trial account, and see everything it can do to make your presentation production process a faster, more efficient version of itself. Staying competitive in almost any business or industry requires finding the most efficient way to get from the beginning of a task or project to its completion. We are constantly taking steps to find the quickest, most direct route from point A to point B. When PCs, PowerPoint and digital projectors became widely available, it no longer made sense to shoot, develop, mount, and place physical, 35mm slides into a carousel in order to support a presentation. But even though PowerPoint made the process of making presentations faster, more flexible, and more cost effective, it still has some room for improvement. There are limitations built into a PowerPoint-based workflow, can throw up big obstacles in your way when trying to create and maintain presentations as a team. PowerPoint saves slides in a presentation or “deck” of slides. While you can apply version control to the whole presentation, there is no simple way to see how an individual slide has changed over time or who made those changes. There is no practical way to revert to an earlier version of a slide without scouring through past decks and then copying and pasting the old version into your current deck. There is also no record of which version of a slide is in any particular version of a slide deck. If someone is working on a slide in a PowerPoint presentation, that deck is not (or should not) be available to other team members to edit in at the same time. Unless, that is, multiple people are working on the same file at the same time, which often happens and almost always creates version control nightmares for everyone. Another big roadblock to productivity occurs when the same slide is used in different presentations. If the slide is updated, it has to be tracked down in every version of every presentation that uses that slide or you risk being surprised by an old version of a slide popping up in the middle of your presentation. PowerPoint doesn’t provide a way to link multiple instances of the same slides across files. 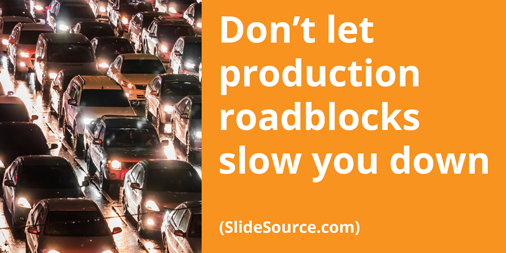 How do you breakthrough PowerPoint productivity roadblocks? The best way is to use a collaborative presentation management tool like SlideSource.com. With SlideSource.com, you upload your existing presentation files into a secure library where all your presentations are maintained as individual slides that can be easily organized into folders. The really great part is that every version of every slide is retained so it’s simple to see how a slide has evolved overtime and you can revert to a previous version at any time. Properties such has who made a change and when it was made are also recorded and retained for each version of every slide. Presentations are built within SlideSource.com using an intuitive drag and drop interface, or created automatically when you upload files. When you look at a slide’s properties, you will see a list of every presentation (and each version of a presentation) that includes that slide. Best of all, whenever slides are updated it is also automatically updated in every presentation they are in. Working on a slide no longer means getting in the way of everyone else that needs to work on the presentation at the same time because you no longer need to lock the entire file for your exclusive access. This means that a presentation with 100 slides could potentially have 100 people working on it at the same time. PowerPoint eradicated many, many roadblocks that once slowed the presentation creation process down to what we would now consider an intolerable crawl. Compared to the speed of current technology, it was a bumper-to-bumper traffic jam that many people working today don’t even remember and can barely imagine. But managing slides and presentations can still be quite a challenge for teams who deal with a lot of presentation content. If you find yourself blocked or frustrated by production roadblocks…. give SlideSource.com a try for free and see how fast you and your team can really go. 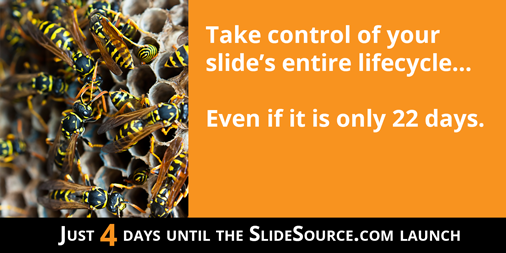 Countdown to Launch Day 4: What is the lifespan of a slide? A worker wasp only lives for about 22 days. Your slides probably live longer. Over the course of its life, a slide may be changed many times. In fact, the final version may not look anything like the original. Do you know where your slides have been? What changes have been made? And by who? SlideSource.com automatically tracks every single version of every single slide you upload. Slides are no longer hidden in “slide decks” somewhere on your laptop or network. You know who, what and when changes were made to every slide. And, you can build presentations from any version of your slides. For example, you may always want the most current version of a slide in one presentation, but you want another presentation to be locked with a previous version. If you have included the same slide in 4 different presentations and you change the slide, it will automatically be updated in every presentation it is in… if you want it to. You are in complete control of your slides and presentations. Put your slides to work for more than 22 days. Manage the complete life cycle of your slides with SlideSource.com.